ChargeIt by Jay Clear Beaded Round Glass Charger Plate 13"
Home > Products > ChargeIt by Jay Clear Beaded Round Glass Charger Plate 13"
Enhance your tabletop presentation with the ChargeIt by Jay Clear Beaded Round Glass Charger Plate 13". 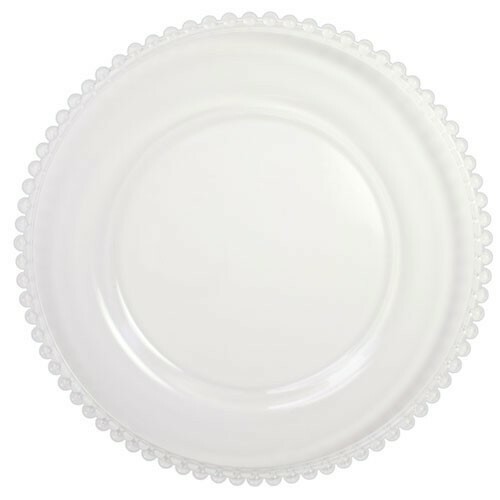 Perfect for weddings and other upscale events, this simple yet sophisticated product is designed with an intricate beaded pattern along its rim for a textured feel. This decorative and economically-priced item provides a striking backdrop to dinnerware. Thanks to its glass construction, this high quality charger plate is food safe and exceptionally durable. Combining style, longevity, and functionality, it not only complements high-end table settings but also protects against spills and mess. Hand wash this charger plate to keep it in excellent condition.